Femme Fatales Harley Quinn B&W PVC Statue SDCC 2015 Exc. Celebrate the Femme Fatales of Batman: The Animated Series with a line of statues, and Comic-Con kicks the line off with an exclusive variant version of Harley Quinn! 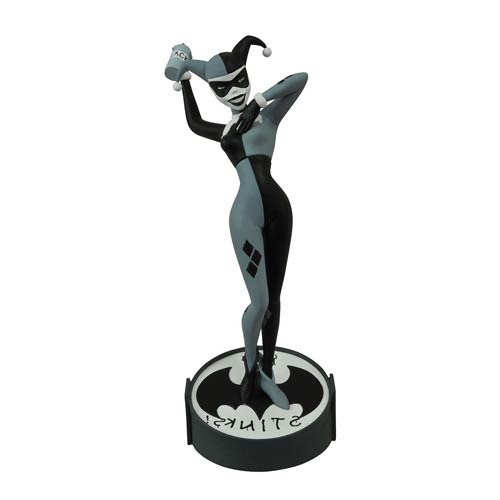 Based on her appearance in the episode "Almost Got 'Im," this statue captures the Joker's partner-in-crime defacing the Bat-signal in two of her favorite colors: black and white! This 9-inch black-and-white statue is crafted from PVC plastic, and comes packaged in a full-color window box. Sculpted by Steve Varner Studios. Limited edition of only 4,000 pieces!